TRUSTe certification demonstrates that Jostle follows TRUSTe’s privacy standards for the Marketplace apps in regards to the collection, storing, use and sharing of its users’ data and adheres to standardized best practices. The TRUSTe certification makes it easy for IT buyers at businesses and schools to quickly assess an app’s data collection practices, improving and simplifying the app evaluation and purchase process. 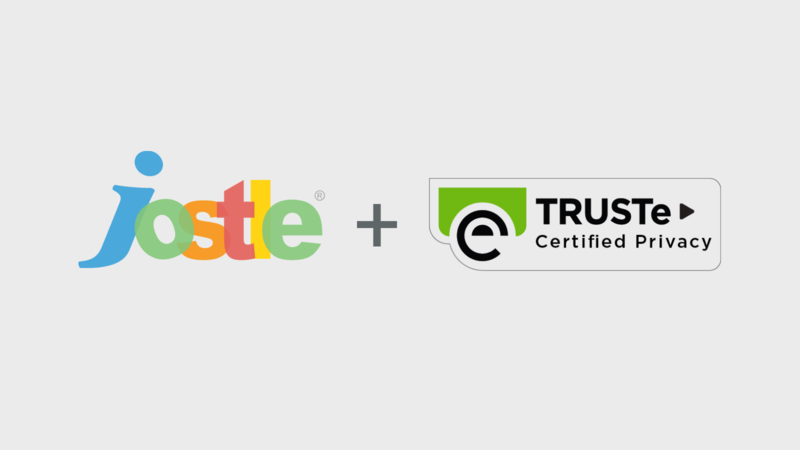 With TRUSTed Apps certification, organizations can be confident that Jostle meets TRUSTe’s privacy program standards – an important consideration when purchasing a Marketplace app. The Jostle organizational platform is available on the Google Apps Marketplace in 3 editions: Chart, Plus and Pro. It’s a robust solution for businesses to map out and navigate their organization, bridging silos of all types and aligning employees like never before. Once signed up, Google Apps users can easily access the Jostle app through Google’s universal navigation, offering them a powerful tool for understanding who does what, when, and where. About TRUSTe – TRUSTe is the leading online privacy solutions provider and provides a broad suite of privacy services to help businesses build trust and increase engagement across all of their online channels - including websites, mobile applications, advertising, cloud services, business analytics and email marketing. Over 4,000 web properties including those from top companies like Apple, AT&T, Disney, eBay, Facebook, HP, Microsoft, Nationwide, Pfizer and Yelp rely on TRUSTe to ensure compliance with evolving and complex privacy requirements. TRUSTe’s mission, based on a “Truth in Privacy” framework, is laid on a solid foundation of transparency, choice and accountability regarding the collection and use of personal information. TRUSTe’s privacy seal is recognized and trusted by millions of consumers as a sign of responsible privacy practices. For additional information on TRUSTe and its offerings, please visit http://www.truste.com.